Burr's presentation of South America. 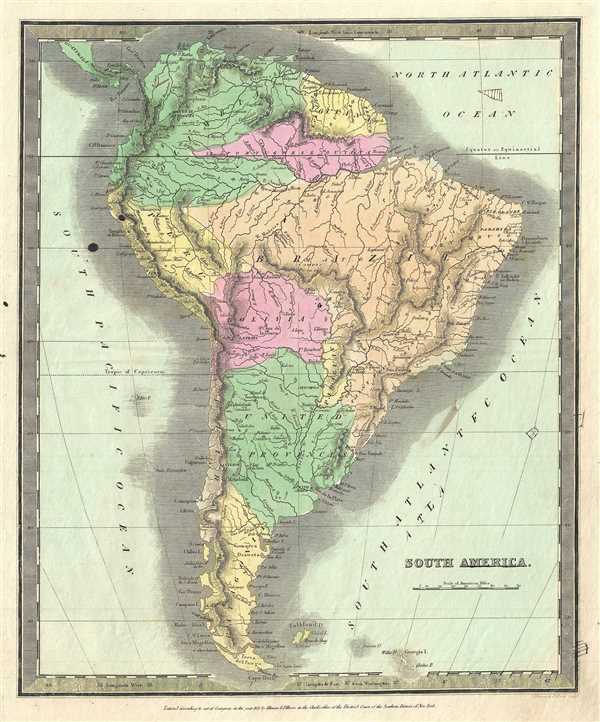 This is a good example of David H. Burr’s 1833 first edition map of South America. It covers the entire continent from the Caribbean to Tierra del Fuego and from the Pacific to the Atlantic, including the Falkland Islands. It includes the modern day nations of Colombia, Venezuela, Ecuador, Uruguay, French Guiana, Guyana, Suriname, Brazil, Peru, Bolivia, Paraguay, Chile, Argentina, and the Falkland Islands. Ecuador, Venezuela, and Columbia are united under the ephemeral Grand Columbia. Bolivia's claims to the Atacama Desert and Peru's claims to the Tarapaca region - both of which are today part of Chile, are shown. Chili extends southward only to the border of Patagonia. Much of South America was, at this time, embroiled in or about to become embroiled in, severe civil strife. The new nations, freed from Spanish dominance though various wars of liberation in the previous decades, were struggling with their newfound independence in an attempt create stable and prosperous governments. Most would dissolve into civil war between 1858 and 1864. According to Ristow, although Burr is credited on the title page, he left this atlas incomplete. He was appointed as topographer to the U.S. Post Office, and of the sixty-three maps finally included in this atlas, only completed eight. The rest of the maps were then completed by Illman and Pilbrow in Burr's style. This map was ‘Entered according to act of Congress in the year 1833 by Illman and Pilbrow in the Clerk’s office of the District Court for the Southern District of New York’, but was not published until the atlas was released in 1835. Published by D. S. Stone in Burr’s New Universal Atlas. Very good. Minor foxing. Original platemark visible. Ink stains at a few places. Rumsey 4628.059. Philips (Atlases) 771.